Above: The Oporto skyline from Cais de Gaia, The King Luis I bridge is to the right. Above: The cruise ship pier and terminal in Lexidores. 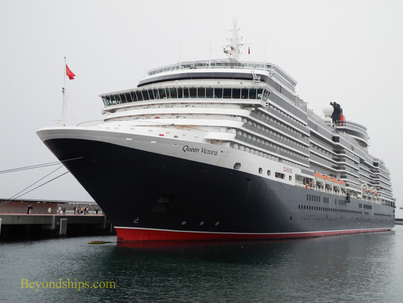 Below: Cunard's Queen Victoria berthed at the cruise ship pier. Above: Paco do Concelho, the City Hall. Below: Parts of the city's defenses are still visible. Above: There are still a few electric tram lines. There is also a street car museum. Below: The Cafe Majestic in Oporto's prime shopping district is one of the city's oldest and most famous dining venues. Although Oporto (called “Porto” by the locals) is Portugal’s second largest city, it has until recently been essentially undiscovered as a cruise destination. This does not mean, however, that there isn’t a lot to see and do during a port call. Oporto is an ancient city. The Romans called this important trading port on the western edge of their empire, “Portus Cale.” Over time, this name was corrupted to Portucale and eventually its use was expanded to refer to the entire country, hence Portugal. The Moors conquered the city in 711 A.D. but were driven out by Vimara Perres, a Christian knight, in 868. Thus, compared to other areas of the Iberian Peninsular, Oporto was under Moorish control for a relatively short period. Consequently, you do not see as much Moorish influence here as in some other Iberian cities. During the remainder of medieval times, Oporto was a trading and shipbuilding center. In 1387, a monumental event took place in Oporto when King John I of Portugal married Philippa of Lancaster, daughter of John of Gaunt. This began an alliance between Great Britain and Portugal that has endured ever since and is considered the world’s oldest military alliance. In the early 18th Century, the wine trade became prominent in Oporto. During this time, Great Britain was frequently at war with France, which was Britain’s traditional source of wine. As a result, Britain looked for alternative sources of wine. Its eyes naturally turned to its old ally Portugal. 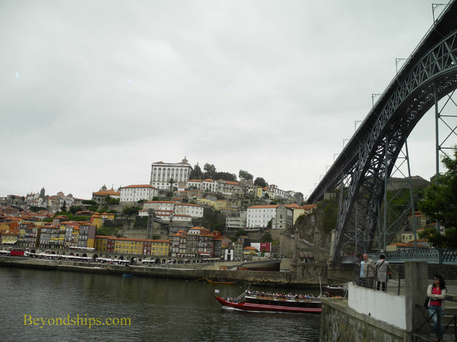 Oporto lies in the estuary of the River Douro and further up the Douro, is an area naturally suited to producing wine. Furthermore, it was found that by adding neutral grape spirits to the wine, it would not spoil on the long voyage to Britain. Therefore, Britain and Portugal concluded a treaty that set a low duty on the importation of wine from Oporto. 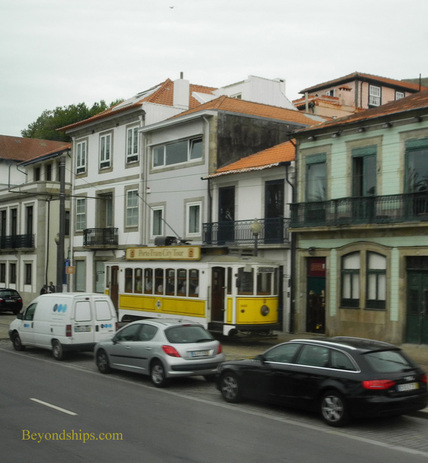 British business men came to Oporto and established many of famous port wine houses that remain to this day. The French also came to Oporto but as uninvited guests. Napoleonic troops under Marshall Nicolas Jean de Dieu Soult occupied the city during the Peninsular War. However, the occupation was very brief as British and Portuguese forces under Sir Arthur Wellesley, (later the 1st Duke of Wellington) crossed the Douro on wine barges and outflanked the French. 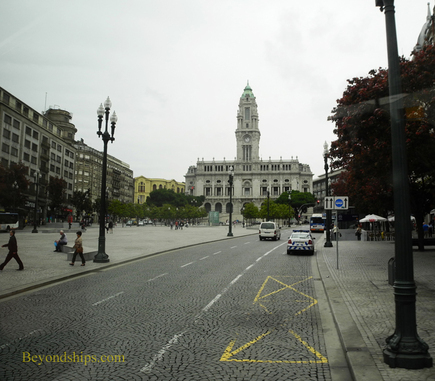 Today, Oporto is part of a metropolitan area with a population of approximately 1.7 million. The towns surrounding the city itself have grown up into industrial and commercial communities. These areas are not tourist-oriented areas but rather modern places where people work and reside. The cruise port for Oporto is in this surrounding belt in Lexiores. Modern ocean going cruise ships have too deep a draft to travel up the River Douro to Oporto itself. 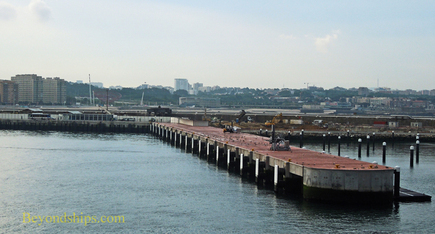 Therefore, they berth at a man-made port which uses sea walls to provide a safe harbor for visiting ships. At the end of the cruise ship pier, there is a small modern building that is used as the cruise terminal. Outside of the building is a parking area for tour buses and shuttle buses. It usually takes 20 minutes, depending upon traffic conditions, to journey from the cruise port to the historic city. 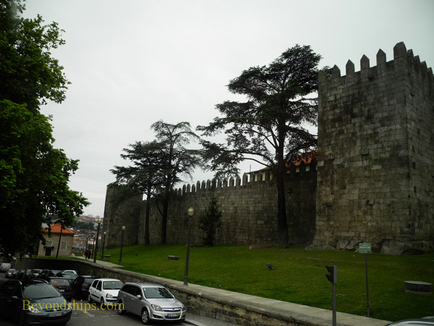 The historic city itself is quite hilly, with steep inclines running down to the Douro. There are few modern buildings on these slopes. Rather, the curving avenues and narrow streets are lined with mostly 18th and 19th Century buildings, punctuated by much older structures. Many are faded but others have seen restoration efforts. 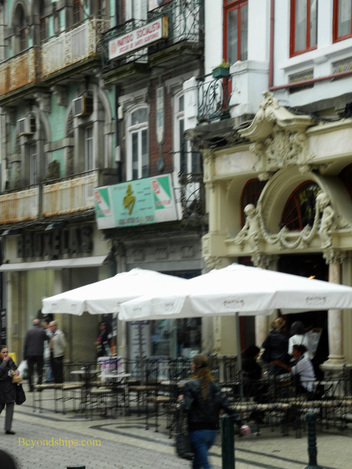 Despite the fact that much of the industry is now in the outlying districts, Oporto is a busy town. The streets hum with buses and autos and pedestrians stroll the shopping areas.